When I bought my camera, it came with a 28-80mm lens. In use, it behaved like a 42-122mm because the camera didn’t use 35mm film in it: it had a smaller APS-C digital sensor. This article briefly describes what is happening, and how to read the names and number on some Nikon lenses. 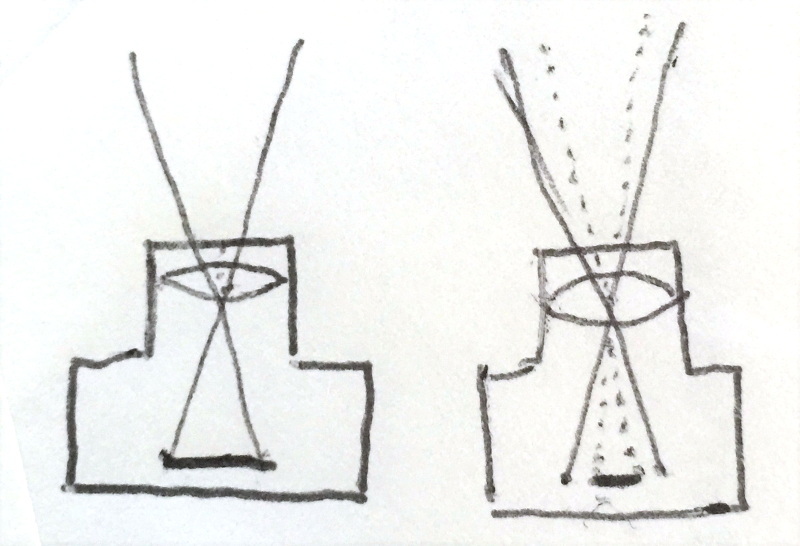 AF – “autofocus” and “F” mount. The F type mount is the most common for Nikon. Nikkor is Nikon’s lens brand. 28-80mm means the lens will have a focal length ranging from 28mm to 80mm. This means it goes from a “wide” angle of view at 28mm to a zoomed-in angle or view at 80mm. 1:3.3-5.6 means that the maximum aperture is 3.3 at the 28mm position, and 5.6 at the 80mm position. G – means “no aperture ring”. One thing missing from the name is “DX”, which indicates that it’s part of the “DX” line of lenses, for digital SLRs with the “DX” sensor, which is a smaller “APS-C” sensor. The Single Lens Reflex (SLR) camera emerged in the late 1950s, and became the standard professional camera for journalists through the 1960s to the early 2000s, when digital took over. These cameras used 35mm film. The dimensions of a frame are 36mm x 24mm. In the 1990s, a new format, Advanced Photo System, was introduced. This was a smaller roll of film, and enabled a smaller camera. The film supported different cropping formats, and one was APS-C, which covered an area of approximately 25mm x 16mm. APS-C was adopted by the major camera makers as the new standard size sensor for prosumer digital SLRs. Since then, the market for DSLRs has been divided into “full frame” or “APS-C“. Full frame means the sensor is the same size as 35mm film. More recently, a new format, “four thirds”, which is even smaller, has further split up the market. Due to the increased splits in the market, the lens buyer must exercise increased vigilance to make sure that they’re not only picking the right mount, but the right product line for their sensor. The picture above shows two “cameras”, the one on the left with a full frame sensor and the one on the right with a smaller sensor, like the APS-C. If you use the same lens on both cameras, the smaller sensor will capture only the middle part of the image. It’s as if the lens now has a narrower angle of view. Because the convention is to describe the angle of view in terms of focal length, the focal length changes; the effect is to increase the focal length. So the 28-80mm lens for a 35mm sensor acts like a 42-122mm lens for an APS-C sensor.